Life can get a little monotonous around here, so the girls always welcome any break in their daily routine. 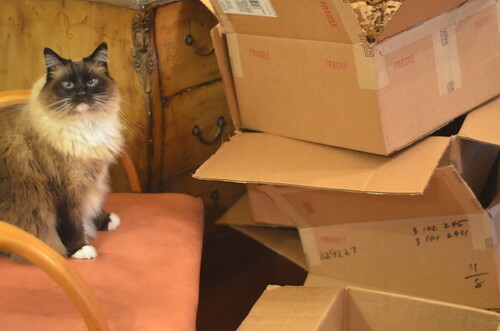 Last night around 7:00 the UPS guy arrived with a giant stack of boxes. The girls scattered as we loaded the boxes into the house, but as soon as the door was closed, they came out to investigate this mountain of bliss in the middle of the living room. CARDBOARD! Glorious cardboard!! Inside the boxes was a set of new dishes, I immediately began unpacking them, and stacked them all of the pieces on the kitchen table. 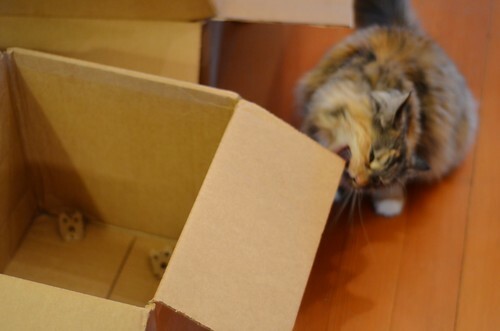 The girls stayed close through the whole process and enjoyed batting the packing materials around, rubbing their faces on every cardboard edge, gnawing on corners, and jumping in and out the boxes. 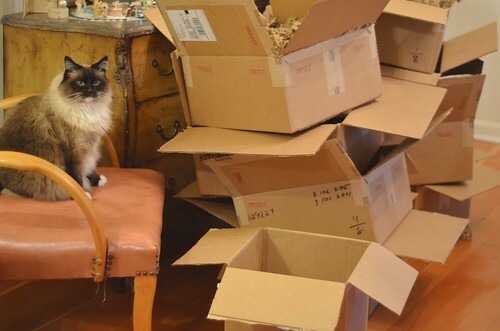 The empty boxes are in a pile waiting to be broken down. That will happen later today. 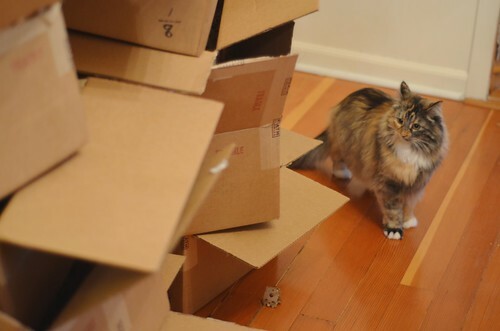 until then, BOX FORTS!! It's a good time to be a cat around here! 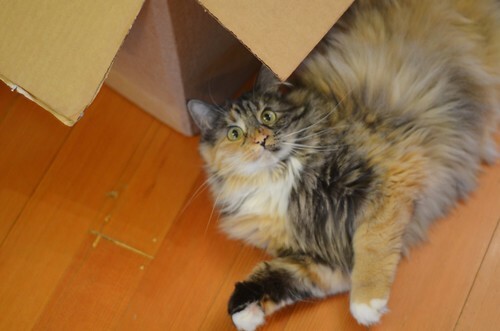 Box Forts need pass words and cat nip and sneak peak at the dishes. Sam and Joan, There's a photo in our Instagram Feed, but we got the Coupe line from Heath Ceramic in Slate/Indigo. I think Wylla likes them more than her birthday presents! Happy belated birthday not-so-little one! B is very jealous of the boxes. *I* am very jealous of the dishes! They are GORGEOUS. You have such great taste! Is it just me, or does it seem that those two girls have exceptionally long whiskers? 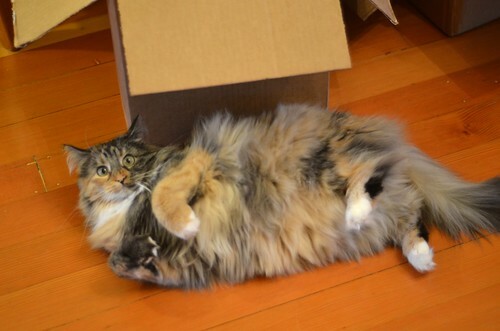 So many cat traps to choose from! Fabulous joys and blisses! That picture of Wylla lying on her side really shows off how much she's grown! She looks great. And happy! 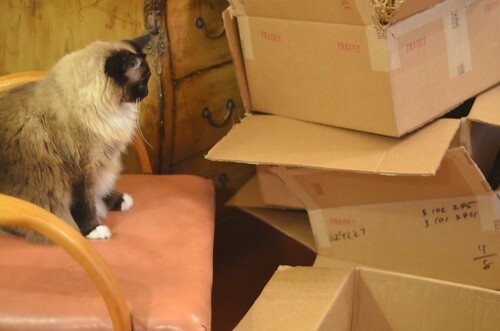 Wow, that must have been a BIG set of dishes to come in so many boxes! 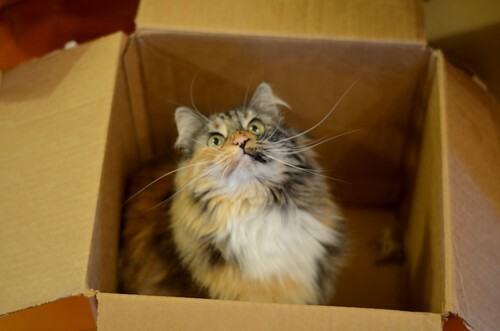 My cat loved boxes too. What are the girls to do once the box elves have snagged the boxes? 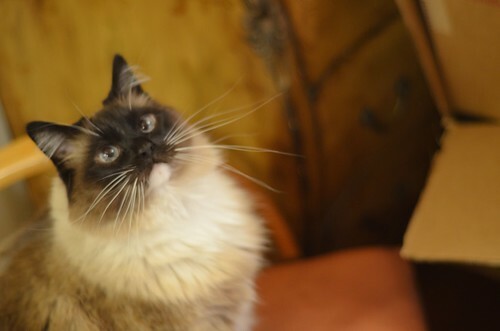 In the mean time, I am in awwww of these incredible whiskers!